n the age of 21st-century global capitalism, family firms are surprisingly persistent. Thirty-five percent of companies in the Standard and Poor’s 500 are controlled by founders or their descendants. Outside the United States, research has shown that families control over 53 percent of publicly traded firms with at least $500 million in market capitalization. One of the most contentious issues surrounding family firms relates to chief executive officer succession decisions. CEO transitions are likely to play a key role in determining firms’ prospects, and they are arguably influenced by the preferences of controlling families, which often struggle between hiring a family or unrelated CEO. 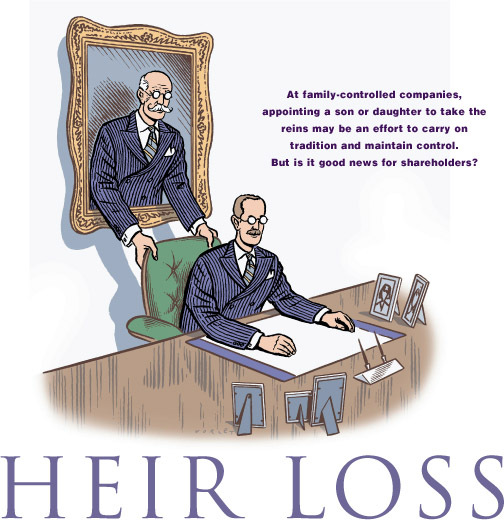 We set out to examine the role of the controlling family in CEO succession decisions and the consequences of family successions on firm performance. Relying on several government and private sector databases, we constructed a dataset of financial, personal, and family information on 5,334 successions between 1994 and 2002 in publicly and privately held, limited liability firms in Denmark. We found that departing CEOs’ family characteristics are strongly correlated with the decision to appoint a family or an unrelated CEO. Family size, the proportion of sons, and even the departing CEO's marital history had a significant impact on the identity of the successor. The performance results aren't altogether encouraging for investors in family companies, or for the families themselves. We found that family successions had a large, negative impact on firm performance. For example, operating return on assets (OROA) fell by 1.4 points for firms that underwent family transitions relative to firms in which an unrelated CEO took over the helm. This decline corresponds to more than 20 percent of the average OROA, which in our sample was 6.5 percentage points. Moreover, as we will explain, this figure is likely to underestimate the true negative effect of family transitions. Overall, family successions occurred in about one-third of our sample (see Table 1). Contrary to anecdotal accounts, not all family successors were children of the outgoing CEO. In almost half the family transitions, a spouse, a sibling, or even a parent was nominated to the top post. The marital history of CEOs affected the choice between a family and unrelated CEO. For CEOs with one spouse, the frequency of family transitions was 36 percent, while for CEOs who had had more than one spouse, the frequency was lower at 25.2 percent (see Panel A). These results suggest that family conflicts might be an important factor in succession decisions. 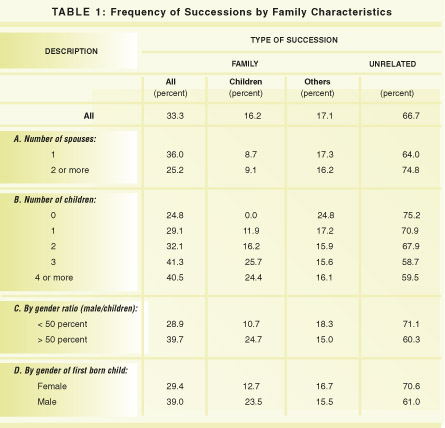 e also found that the frequency of family successions increased with the number of children (see Panel B). It rose from 29.1 percent for departing executives with one child to 41.3 percent for those with three children. The structure of the family also affected who in the family got promoted to the CEO position. We observed that the frequency with which departing CEOs nominated one of their children to the top post increased from zero (by construction) when they had no children to 11.9 percent when they had one child. At the same time, the frequency with which departing CEOs nominated non-child relatives to the CEO position decreased by 7.5 percent, suggesting that children crowd out other family members. The gender of children was also a factor. Firms in which more than 50 percent of the outgoing CEO’s children were male were 10.8 percentage points more likely to have a family successor than firms in which less than 50 percent of the outgoing CEOs children were male (see Panel C). Outgoing executives whose first-born child was male were 9.6 percentage points more likely to leave the firm to a family member than those whose first-born child was female (see Panel D). hese correlations confirm anecdotal evidence that sons are preferred to daughters at the time of succession, even in a developed country such as Denmark. The magnitude of these correlations are surprising given that Denmark ranks fourth among 58 countries in gender equality, according to data from the World Economic Forum, and has one of the highest female labor force participation rates in the world. Nevertheless, these numbers are consistent with the low levels of women among top management positions in Denmark, which in 2004 was only 25 percent, compared with 61 percent at middle level management positions. In summary, we found that the structure of the controlling family influenced the choice between a family member and an unrelated CEO, and that it also affected who inside the family was offered the CEO position. We next studied the performance implications of family transitions. It is unclear from a theoretical perspective what impact family CEOs should have on firm performance. Family members could perform better than other CEOs because they derive greater personal satisfaction from the success of the organization and face higher levels of shame or guilt in case of failure. Also, the trust and loyalty established with key stakeholders might be more easily transferred to family executives. And by virtue of having grown up close to the day-to-day business of the organization, they might be more knowledgeable than outsiders about the firm. On the other hand, outsiders are a self-selected group of individuals with significant managerial expertise. Also, family CEOs might be affected by the potential conflicts between family and business norms with regard to the allocation of management positions, pay, or other corporate resources. A simple way to evaluate the impact of family CEO succession on performance is to compute the change in firm profitability around CEO successions. A problem with this approach is that it can potentially fail to control for aggregate changes in performance due to, in some cases, industry or aggregate trends, or mean reversion in performance measures. For example, the finding that performance worsens after family transitions would not be informative about the competence of the incoming CEOs if all firms in the economy were experiencing the same decline. A common solution to this problem is to use a difference-in-differences (DD) analysis by comparing the changes in performance of firms that name a family member to the CEO position to those of other firms that experience a succession by unrelated CEOs. When we used the DD approach, we found that firms that promoted family members experienced a decline in industry-adjusted OROA of 0.1 percentage point (see Table 2). In contrast, firms that chose unrelated managers for the top position saw improvements in industry-adjusted OROA of 1.3 percentage points. This suggests that family successions are associated with 1.4 percentage points lower performance relative to unrelated successions. This decline is equivalent to approximately 20 percent of the average unadjusted OROA. We repeated the analysis using three other measures of performance and, in all cases, found that firms that underwent family transitions trailed others in performance. Do these results prove that family member CEOs are worse than professional managers? Not necessarily. The decision to appoint a family CEO is unlikely to be made irrespective of a firm’s business prospects. For example, it is possible that non-family CEOs are appointed when an improvement in performance is in sight. If this were the case, we would not be able to conclude from our DD results that outside CEOs are more competent, since they were chosen in firms that were expected to do well. Conversely, it could be that family members are appointed to the top position in firms with superior business prospects. In this case, the effect of family member CEOs on performance would be even more damaging than our DD analysis suggests, since family members generated the inferior performance while managing the best firms. o isolate our results from such effects, we used an econometric technique known as instrumental variable estimation. This technique involves estimating the effect of family transitions using only firms whose succession decisions were driven by some variable that does not affect firm performance. By focusing on these firms, we eliminated the aforementioned concerns that other firm characteristics, such as business prospects, are responsible for both the decision to name a family member and for performance after the transition. Finding such a variable is usually difficult because many of the factors that affect the choice of CEOs (leadership skills, experience, etc.) presumably also affect performance. However, in our setting, we were able to find such a variable: the gender of the first child of the departing CEO. Earlier, we established the strong impact of the gender of the first child on the probability of family succession. In addition, it is difficult to imagine that the gender of the first child born to the CEO directly affects firm performance. 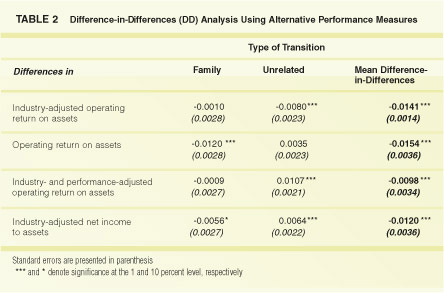 Using this technique, we found that family transitions were more damaging to performance than our DD estimates suggest: family transitions caused a decline in OROA of at least 4 percentage points. We then investigated whether the relative performance of family member CEOs varied with observed industry characteristics. A natural place to start this analysis is investigating if the gap in performance for family member CEOs differs in industries where such CEOs are relatively more common, and presumably better suited for their positions. We found that they were indeed less detrimental to firm performance in those industries where they were more commonly found. Next, we hypothesized that managerial skills are more valuable in certain economic environments, such as rapidly growing industries, where managerial discretion might be relatively more important. When we analyzed the results, we found that indeed family member CEOs tended to be costlier in these environments. The results demonstrate that family successions cause significant declines in firm performance. They also imply that qualified CEOs provide extremely valuable services to the organizations they work for. In addition, the findings suggest that primogeniture rules that dictate who gains access to the helm of a firm based on birth order or gender, but not competence, can have disastrous consequences for firm performance. For controlling families, the lower performance caused by family member CEOs might be offset by the pride and satisfaction of keeping the firm in the family. However, this is unlikely to be the case for minority shareholders, who are likely to suffer the most under family member CEOs. The lower performance of family member CEOs also indicates that other stakeholders interacting with family firms should pay close attention to succession decisions as the competence gap between family and unrelated CEOs might be substantial. Morten Bennedsen is professor of economics at Copenhagen Business School, KASPER NIELSEN is a PhD candidate at the Centre for Economic and Business Research at the University of Copenhagen, FRANCISCO PEREZ-GONZALEZ is assistant professor of finance and economics at the Columbia University Business School, and DANIEL WOLFENZON is assistant professor of finance at NYU Stern.